One Katy-sized Bubble, Coming Right Up! Sentence of the Day- "Up There..."
"My future's so bright that I need shades....!" Having a peek inside her mouth and operating some of the dental tools. 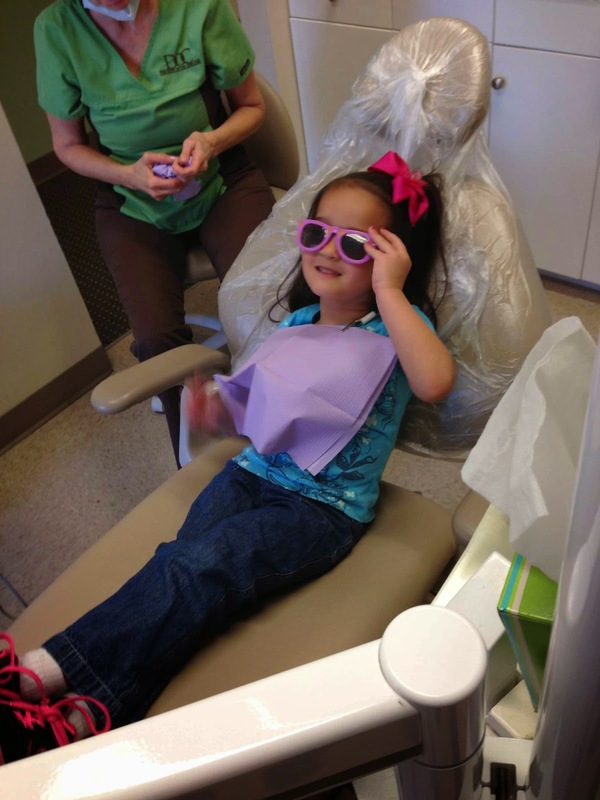 Katy had her first "big girl" visit to the dentist today!! She's come along with us to our appointments, up until this point. Sometimes, she would observe our exams. Sometimes, she would even let the hygienist "count" her teeth and brush them. However, this time, she actually had all the dental tools used on her (i.e. our insurance was billed, specifically for her! ;-). I've got to admit, I was really worried about this one. In the past, she's been less than thrilled to even attempt to sit in the exam chair by herself. 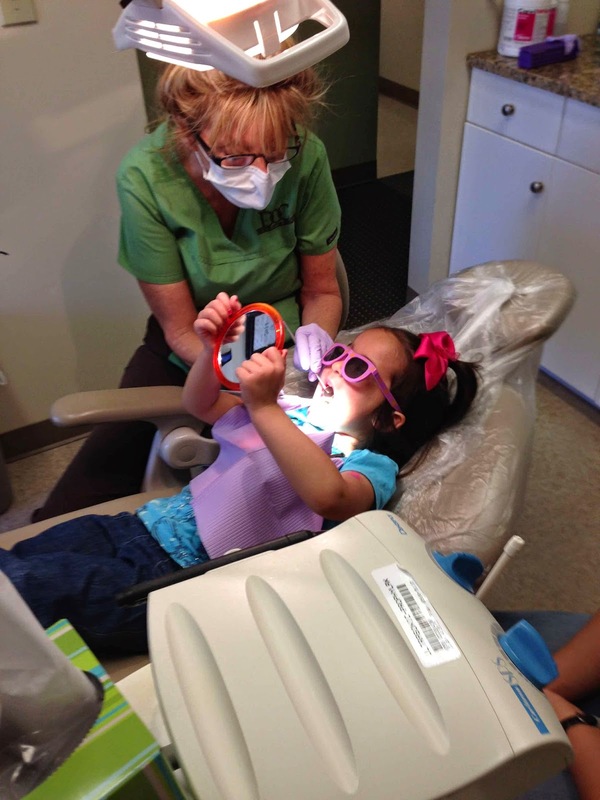 There have been times where she's been afraid of whatever tools the hygienist was using. I was afraid that a) Katy would refuse to sit in the chair and throw a tantrum, b) Katy would clamp her mouth shut and not let the dentist look inside, c) All of the above (and then some!). You know what, though? Katy was AWESOME!!! She did SOOOOOO well this afternoon! Katy hopped right into the chair when it was her turn. She obligingly put on the "sunglasses" to protect her eyes from the exam light and opened her mouth willingly. She was pleasant and funny and interested in what was going on. She cracked a joke with the dentist! She even tattled on me by telling the hygienist that I had brushed my teeth right before our appointment. After everything was done, Katy got to pick the color of her new toothbrush (pink, of course!) and pick a prize from the treasure box (a costume ring, of course!). 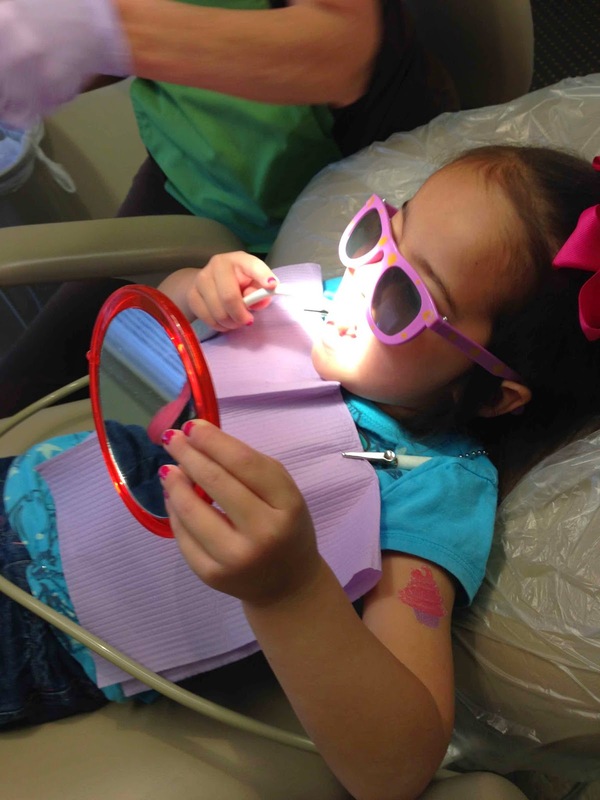 She chatted her way out of the office and kept telling us how the dental tools "tickled." She liked "helping" the hygienist (Katy was allowed to operate the sucking machine thingy) when it was my turn for my exam. No fights, no fussing, no complaining! Best of all, no cavities!